How to get the complete URL of a Azure Function from a different function inside the same App Service? I'm running a single Azure Function on the consumption plan. I've picked the consumption plan for the serverless feature as well as to minimize cost. The function consumes messages from a service bus topic and writes some output to blob storage. Keeping the function running for the last 30 days is around $10. That's very acceptable, since the function has a lot of messages to consume. Writing the output to blob storage is around $20. Also acceptable. What I don't understand is, that the charge for the Function's underlying storage account is around $70 for the same period. The consumption is primarily hitting File Write Operation Units and File Protocol Operation Units. The storage account is created as locally redundant general purpose v1. I've disabled logging in my function, by removing the AzureWebJobsDashboard app setting. But these tables still seem to contain A LOT of rows. What's going on here? Is maintaining these tables from serverless code really required and does it sound normal that the price for table access is x7 the price of the function itself? When I tried the following example by copying the script and put it in my Visual Studio. When I try to run the Deployment template comes out blank. How do i run this the arm template? Currently I am working on the one GPS tracking project. The tracking app sends the data to API after interval of 20 seconds and I checked that data with existing address point (Almost 200k) I developed the code through Sql Server geography and .net core. I have tested application with 10 users on local IIS. Now I want to deploy this app to UAT. So what type of Azure server configuration I need to have for such thing. My table in future will have Trillions of data. I already applied spatial indexing on that. and also I am little curious now what type of Azure server do I need for a GPS tracking (SQL database table will have trillions of rows. I applied one column datatype as a geography and used Spatial indexing on that column) In elastic pool getting error elastic pool limit has been reached. As tracking app sending the data in the interval of 20 second. So is it possible DTU will reach this limit with only 10-15 simultaneous tracking users. This is my first crack at creating an Azure App Function. I've got it working when running on my local dev machine. Now I've deployed it into Azure, and I'm attaching the debugger to it (very cool, btw!). When running on my localhost, I can use the local.settngs.json file for all of the app settings. That works fine. 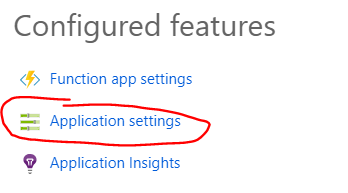 But I seem to be hitting a roadblock on the simple process of accessing application settings when running the function remotely in Azure. First (and this is a battle I will fight later) I'm sure there is a way to auto-populate the settings in the Azure Function based on what's in local.settngs.json, but for now, I added them all manually. The error has me kind of stumped, as it doesn't even seem to apply. Why, for example, is it calling GetDirectoryReference(String itemName)? In Azure Functions, when you create a function, this one gets a unique GET code for calling it. Using a App Service that has two or more functions, I want to, from one of those functions, access the complete URL with the GET code of a different function. When "something" happens, /api/PreSomethingHook?code=ew12e12ew2e should be called. I want PreSomethingHook to start a long process in an external API which, one of the parameters it receives, is a callback url for when the process finishes. Now, when the process finishes, PostSomethingHook should be called and handle the result. How can I obtain a function's URL with it's GET code from a different function inside the same App Service? I'm creating an Azure Function and I've added a reference to a project that uses Entity Framework. I've copied the connection string from that project and pasted in the local.settings.json file inside the ConnectionStrings object as a valid EF connection string. How could I create a connection to my database in an Azure function using Entity Framework? I'm using .NET framework and for EF I'm using database first. Keyword not supported: data source.